MILLBROOK, England–(BUSINESS WIRE)–The Airspan led 5G for Connected and Autonomous Vehicles (CAVs) consortium, AutoAir, has made huge strides at the Millbrook Proving Grounds test track this week. The consortium announced the final deployment of a Hyper-Dense small cell network of 89 base stations operating in the in the 2.3 and 3.4-3.8 GHz mid-band spectrum, including a 22 sector high-speed mobility 57-71 GHz mmWave highway system, delivering 5 Gbit/s every 300m. The live public demonstrations showed the system delivering greater than 1 Gbit/s capacity to a McLaren sports car while travelling at 160 mph on the Millbrook high-speed bowl with handovers occurring every 2 seconds. Real-time Telemetry was provided by McLaren’s Altas system. A second demonstration showed real-time video streaming between multiple vehicles (each with four 4K cameras). The video was streamed between a range of different passenger cars, coaches and emergency vehicles which included police cars, fire trucks, and ambulances. These important achievements are fundamental steps towards enabling the key 5G use cases for CAVs. The AutoAir test bed at Millbrook can also directly contribute to 5G in other adjacent sectors such as Rail Transportation. 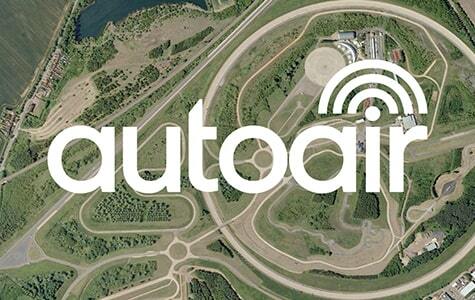 The AutoAir project is a consortium of partners led by Airspan Networks and is hosted at Millbrook. It is a unique, accelerated development programme for 5G technology and is based on small cells that operate on a “Neutral Host” basis. The shared neutral host platform allows multiple public and private mobile operators to simultaneously use the same infrastructure through network slicing, which can radically improve the economics for 5G networks. Other partners in the AutoAir consortium are Blu Wireless Technology, McLaren Applied Technologies, the 5G Innovation Centre at the University of Surrey, Dense Air, Real Wireless, Quortus, and Celestia Technologies Group.